Steve McClaren's Derby side moved up to third in the Championship with an easy victory over Leeds at the iPro Stadium. Derby were on top throughout and went ahead before half-time when midfielder Alex Mowatt put through his own net. They threatened again as Richard Keogh and Jordon Ibe forced Leeds goalkeeper Marco Silvestri into decent saves. 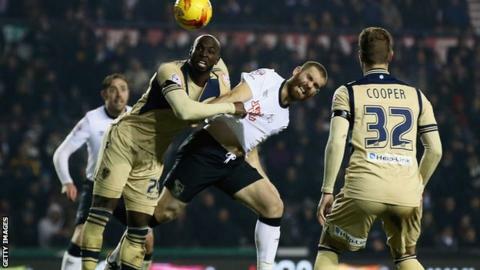 The hosts went 2-0 up early in the second half as Jake Buxton headed in Jeff Hendrick's free-kick, but Leeds managed just one shot on target. Neil Redfearn's side remain in 20th in the table - one point above the relegation zone - and the lacklustre performance shows they face a tough battle to avoid the drop. "This Leeds team look hopeless, it will be a struggle to stay up. They haven't got a leader. I have seen great Leeds teams playing with energy and passion but they have been very poor tonight." Derby dominated possession but it took until the 41st minute to break the deadlock as midfielder Will Hughes surged into the box before cutting the ball back into the path of the unfortunate Mowatt. The Rams could have doubled their lead before half-time, but Silvestri did well to keep out Keogh's flicked header and Ibe's long-range effort. But they did go further ahead two minutes after the break with defender Buxton powerfully heading home to end the match as a contest. Leeds won 2-0 when the two sides met in November but were poor this time, and striker Mirko Antenucci forced Lee Grant into a comfortable save - their only noteworthy strike on goal. "A great job, disciplined and professional. The tempo kept going, they were going to tire and we scored. We were in control from the second goal. "Will Hughes has been fantastic. You have to put the ball in the box, that is where you score and great credit to Hughes for the first goal. "Jake Buxton was suspended but we brought him back and you see him and Richard Keogh are a rock for us, he then went and got a goal." "The goal gave them a leg up and even at 1-0 down, I thought we were in the game. We looked solid enough in the first half but probably didn't carry enough threat. "Alex Mowatt tried to clear it but we are having no luck at the moment. We have to stick together and believe in what we are doing. "If you open out too much, you can get swamped and it was difficult to get a foothold in the game and get the ascendancy. We didn't have the cutting edge and the lads are unhappy, it wasn't a good result." Match ends, Derby County 2, Leeds United 0. Second Half ends, Derby County 2, Leeds United 0. Rodolph Austin (Leeds United) is shown the yellow card for a bad foul. Substitution, Derby County. Paul Coutts replaces Johnny Russell. Attempt missed. Rodolph Austin (Leeds United) right footed shot from outside the box is too high from a direct free kick. Attempt blocked. Mirco Antenucci (Leeds United) left footed shot from the right side of the box is blocked. Assisted by Alex Mowatt. Substitution, Derby County. Simon Dawkins replaces Jordon Ibe. Adryan (Leeds United) wins a free kick on the left wing. Attempt saved. Chris Martin (Derby County) right footed shot from outside the box is saved in the centre of the goal. Assisted by Craig Forsyth. Substitution, Leeds United. Adryan replaces Tommaso Bianchi. Attempt missed. Johnny Russell (Derby County) left footed shot from outside the box is too high from a direct free kick. Jeff Hendrick (Derby County) wins a free kick in the attacking half. Offside, Leeds United. Tommaso Bianchi tries a through ball, but Mirco Antenucci is caught offside. Corner, Derby County. Conceded by Sam Byram. Attempt missed. Jordon Ibe (Derby County) header from the centre of the box misses to the left. Assisted by Cyrus Christie with a cross. Substitution, Leeds United. Billy Sharp replaces Souleymane Doukara. Attempt blocked. Jeff Hendrick (Derby County) right footed shot from outside the box is blocked. Assisted by Chris Martin. Tommaso Bianchi (Leeds United) wins a free kick on the right wing.